Great hold for strong hair. Have tried a few other products, but for me this is the best as I don't need to use a lot for a good confident hold. Delivery via Royal Mail tracked, no signature require. For me this ideal for a small order. I am tempted to drop a star because of the price fluctuations. 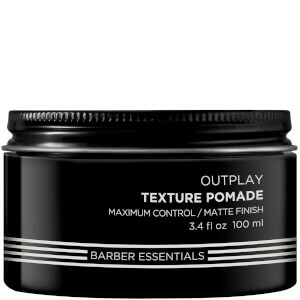 Haven't used this product for some time (local barber stopped selling it) and delighted to have found it on lookfantastic. Gives that great wax hold yet very natural feel. Great product. this is a great product and i have been using this for over 10 year.i would recommend this item. This is a product that can be relied upon. Only need to use a small amount and when rubbed in and scrunched into your hair this gibes a natural curly look. It says this is for men but definitely unisex would not use nothing else. Purchased for my husband. Product is good when first applied but doesn't hold the whole day. I bought this for my boyfriend,and he loves it very much.The wax is not greasy, and the shaping effect is very good.I help my boyfriend to shape his hair. Easy application ever. For those who like a molded and controlled with a natural-looking effect, is the best option. No residue in the hair even after dry. Never get a natural look was so easy! i was looking for a good smelling wax and this one is the answer. Smells great, easy to use, easy to wash. I'll certainly buy it again! A great smelling hair wax which, as advertised, provides medium hold for your hair and is easily washable as well. Doesn't leave your head feeling like you took a swim in a pool of oil and is great for someone with short or medium length hair.